An ear to outer space: The Arecibo radio telescope in Puerto Rico has picked up mysterious "fast radio bursts" (FRBs) that possibly originate from the farthest reaches of space. The findings confirm space sounds previously picked up by the Parkes radio telescope in Australia.Courtesy Public domain via WikipediaAstronomers in Puerto Rico have now confirmed those mysterious and brief sound bursts first picked up by the Parkes radio telescope in 2012 as extragalactic, i. e. originating somewhere outside our galaxy, possibly as far as 9 billion light-years away. 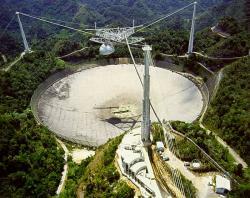 The Arecibo radio telescope - located in the karst hills of Puerto Rico - has detected the same "fast radio bursts" (FRBs) coming from somewhere beyond the Milky Way. The FRBs, also known as "Lorimer bursts" are extremely short in duration occurring about every 10 seconds. The exact source of these FRBs is still up in the air - so to speak - but the new study indicates that at least they aren't coming from anywhere on Earth. "Our result is important because it eliminates any doubt that these radio bursts are truly of cosmic origin,” said research team member, Victoria Kaspi, an astrophysics professor at McGill University in Montreal. "The radio waves show every sign of having come from far outside our galaxy – a really exciting prospect." But what the space noises are exactly remains a mystery. Speculation includes all sorts of strange goings-on including evaporating black holes, a neutron star cannibalizing another neutron star, or magnetic pulses from magnetars, bizarre neutrons stars possessing super-powerful magnetic fields. The study's co-author, James Cordes, a professor of astronomy at Cornell University posits that they could be "bursts much brighter than the giant pulses seen from some pulsars". The study appeared in the July 10 issue of The Astrophsyical Journal.